CHANTILLY, Va. — Recently hurricanes, wildfires, floods, gas explosions, and other disasters put our citizens and responders at risk. In 2003, recognizing the problems faced by responders and the military, First Line Technology was formed with the mission of developing new solutions to solve some of the most critical challenges. "We work closely with many responders and the best researchers in federal and university laboratories to identify new technologies that can be leveraged to protect lives and reduce the damage," said Amit Kapoor, President and CEO of First Line Technology. After Hurricane Katrina, Kapoor was shocked to see hundreds of school buses abandoned in the flooded parking lot while hundreds of patients in hospitals and nursing homes were waiting to be evacuated. "It got us thinking, why can't those school buses be converted into multiple patient transport vehicles?" Thus, the AmbuBus was born. The AmbuBus Conversion Kit enables a community to convert any available school or metro bus into a multi-patient transport vehicle. The kit can be assembled by two people in about two hours without power tools. It can hold between 16 and 24 passengers in a single trip. With the rise of Fentanyl and other synthetic opioids, police, fire, and EMTs were suddenly at risk of accidental overdose. Dahlgren Decon can completely neutralize Fentanyl in about five minutes and is effective against hundreds of other existing and emerging threats. First Line Technology also developed FiberTect wipes and gloves which are used to remove bulk amounts of contaminants before spraying the residue with Dahlgren Decon. While working closely with firefighters, hazmat teams, special forces operators, and other first responders and military users it became apparent that many of them suffered heat stress frequently while training or operating in hot weather. According to Amit Kapoor, "Preventing heat stress is better than treating heat stress." During periods of activity in high heat conditions, operators wear PhaseCore personal cooling vests. These professional grade cooling vests contain several salt-based, phase change cooling elements that activate at 820 Fahrenheit and that do not require refrigeration to use and recharge. When the operator takes a break from his activity for rest and rehabilitation, they can reduce the time it takes to bring their body's core temperature back to normal using First Line Technology's Immersion Cooling Equipment or ICE System. This purpose-built, portable device can hold 55 gallons of water and ice. Up to six users at a time immerse their forearms into the water and walk in place to circulate their blood faster. Depending on the temperature of the water, their core body temperature will reduce by 1.8o Fahrenheit every three to ten minutes. First Line Technology has just launched a completely redesigned website, www.firstlinetech.com with videos, use cases, white papers and other resources to provide guidance in selecting and using their products and services. "No matter what problems are encountered by our first responders and the military now or in the future, First Line Technology together with our partners in federal laboratories and universities will work to discover, develop, and bring to market innovative solutions that make our citizens, responders, and the military safer and more effective," said Kapoor. 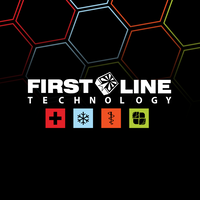 Request more product info from First Line Technology.